After reading this question and seeing an image of ISS shot from earth, a doubt came in mind that if shooting moon from earth with high details is possible, why is it difficult to shoot artificial satellites from earth? There are two parts to this question. One is around speed (or apparent angular velocity) and one is around size. The Moon's apparent velocity is small, so it is easy to set up a telescope or camera to take a photograph at an appropriate exposure. Many satellites, and the ISS are much closer, so the apparent velocity from the observer's perspective is a problem - you need to track at speed. The Moon is big. The fact that you can take a good picture of it doesn't mean you are taking a picture at high detail. In fact you are getting pictures of the moon at probably lower detail than pictures of closer satellites. But the size of the moon means this probably isn't an issue. Being able to resolve a rock 50m across on the moon is overkill for many purposes, but even 20m resolution when trying to photograph a satellite probably means you can't see it at all. There is also an issue around brightness - satellites have limited periods of visibility as they move in and out of the Earth's shadow, and typically are not visible at all during the day (obvious exceptions include Iridium flashes - but you need to know where and when to look). The moon reflects a lot of light, which makes finding, focusing and tracking it very simple. Really simplified answer: Anyone can see the moon. It's huge. You normally can't see an artificial satellite, it's tiny. When you can see it, it's a tiny point, like a distant star. Same goes for a camera / telescope. What you call "High detail" of the moon is probably tens or hundreds of metres across per pixel on the moons surface. A satellite is just not that big. 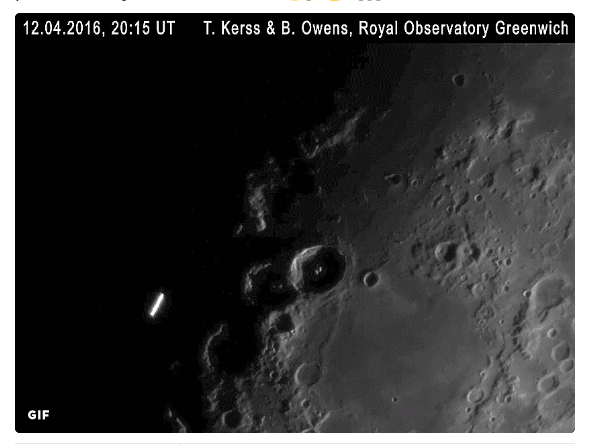 Interestingly, astrophotographers T. Kerss & B. Owens photographed a satellite flying in front of the Moon last year! It was a "normal satellite" if there is such a thing, and not something huge like the ISS. You can read more about it in answers to What actually happened here with a satellite, the ISS and the moon? It was a large telescope and still the satellite is just a dot, and moving really, really fast! Could a spy satellite image another satellite? and there are telescopes monitoring expensive communications satellites in GEO all the time that can see the parts fly off of a satellite once it's been hit by debris! Not the answer you're looking for? Browse other questions tagged the-moon artificial-satellite telescope photography or ask your own question. Why is momentum transferred to the moon? Why doesn't a full/gibbous moon high in the sky ever seem to look orange? Shouldn't it?